Nice Work, LLC builds on WordPress for clients, so they choose Give as their donation plugin. But then their client needed additional functionality, extending Give was the natural answer. Hunger isn’t just a global issue. Facing the reality that children in U.S communities go hungry every day is difficult, at best. The Arlington Food Assistance Center in Arlington (AFAC), Virginia distributes groceries to more than 2,200 families every week to take on this challenge in their community. Over 35% of the people they serve everyday are children. Prior to working with Tara Claeys and Evelyn Powers of Nice Work, LLC, AFAC was using a third-party donation software to collect online donations. This meant they were losing about 10% of each donation to fees. To make matters worse, as the third party collected donations from AFAC donors, those same donors were solicited for support from the vendor for its own charity upon checkout and throughout the year. In 2014, Nice Work removed the third-party system and created a donation platform on AFAC’s website which used Gravity Forms to collect online donations via PayPal. The result: a 33% increase in web gifts for AFAC, and AFAC retaining sole propriety of their donor data. Since personal fundraising is popular with third-party donors. 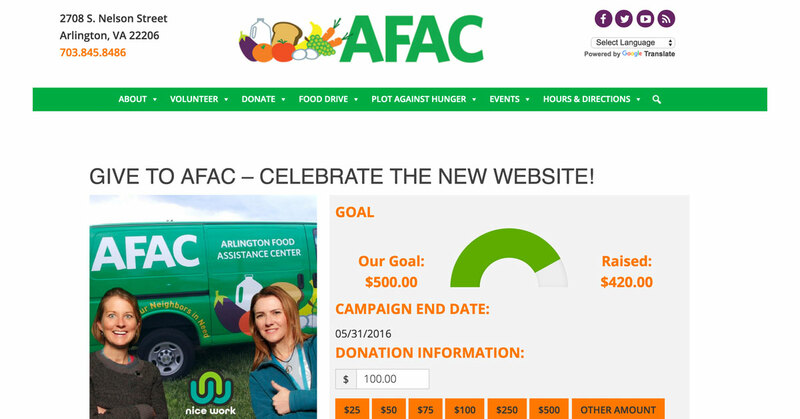 In early 2016, Nice Work proposed that AFAC create a program to allow users to create their own Personal Fundraising Campaign. As well-known charity in the region, people in the community were looking for ways to help AFAC. Some held food drives, others volunteered their time in service, doing things like bagging food or collecting food from donation centers. Tara and Evelyn knew that AFAC sometimes turned away volunteers because the volunteer spots filled up so quickly, and that the community was eager to help feed those in need. Many third-party donation systems offer a personalized fundraising program, but setting up such a system via Gravity Forms or Give was not an out-of-the-box solution available for AFAC’s WordPress website. 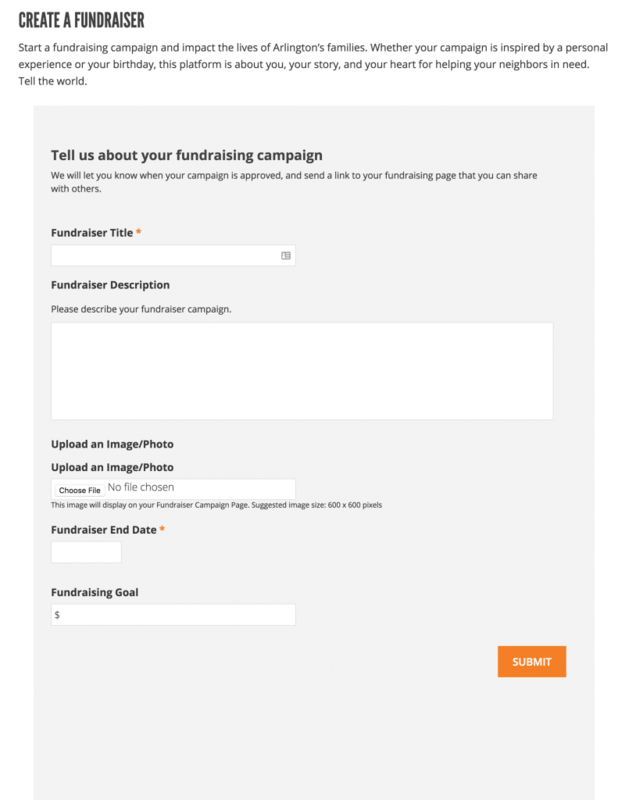 So Nice to Work enlisted the help of Tom Ransom, of One Big Idea, to create a Personal Campaign Plugin that works with Give to offer the front and back end functionality for personal fundraising campaigns. We chose Give as the basis for this plugin because it already contained a solid donation platform and reporting, so it was relatively straightforward to extend the donation system with custom fields and code to create a separate plugin that works with Give to allow donations to be registered on a per-campaign basis. One Big Idea did an excellent job of writing code that works seamlessly with Give, integrating the reporting of Give with customization which shows donations for each personal campaign. 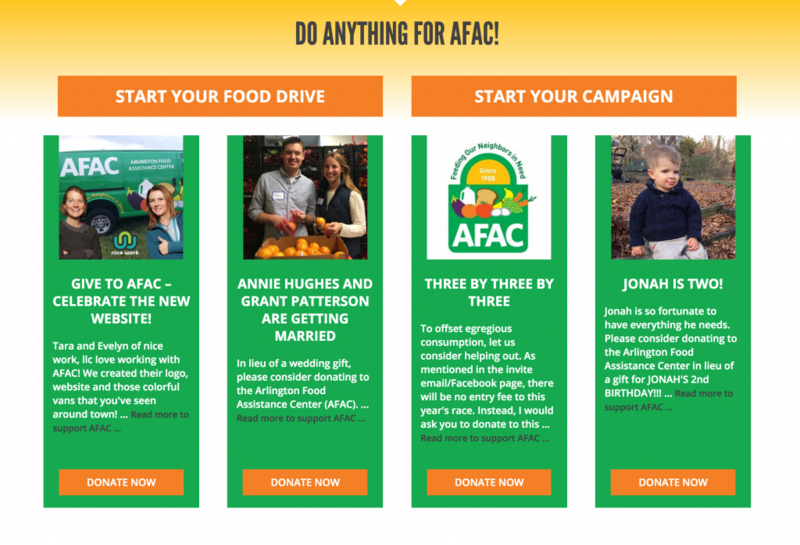 The AFAC website uses a Gravity Form, and Gravity Form Custom Fields, to allow a user to create a personal campaign, with a featured image, a fundraising goal and short description. Once submitted, this form triggers the Personal Campaign Plugin to create a new campaign in draft status, until an AFAC administrator approves it. Upon approval, an automatic email is sent to the organizer, giving them a link to share their campaign page with friends and family. When donations to the campaign are made, the organizer, as well as AFAC staff, receive an email notification that a donation was made to that campaign. A thank you email is also sent to the donor. The gauge on the campaign page shows the fundraising status, as well as a list of donors. On the back end, the Give Plugin transaction list shows these donations, and a new column has been added to show which campaign the donation was for. The AFAC site is built with Genesis, so One Big Idea also build a custom widget, similar to the Genesis Featured Posts widget, which allows selected “Featured” campaigns to be featured in the widget area on the Home Page. Now that the new website is up and running, AFAC is planning a marketing strategy to promote the new personal fundraising campaigns and get the word out. 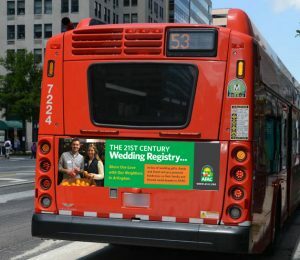 Email campaigns and marketing materials like bus signs have been proposed for later in 2016. What would you do for AFAC? Check out Tara and Evelyn’s personal fundraising campaign and share it to help feed hungry people in Arlington, Virginia!. Plans for the future of a more general, public-use version of the Personal Fundraising Campaign are still evolving. In the meantime, if you would like to learn more about the plugin created for AFAC, please contact Tara Claeys.